My love of the cape gooseberry, rasbhari, physalis or sometimes “Chinese lantern”, knows no bounds. Every year at this time I can never quite get over seeing in abundance a fruit which at home is bought by the handful rather than the kilo. As well as being the most cheerful-looking of fruits, cape gooseberries are perfect for baking and I always have more ideas for recipes than I have time to make. Like old-fashioned varieties of apple and the green English gooseberry, they lend a welcome tartness to otherwise over-sweet desserts. They’re perfect for all sorts of puddings, pies, crumbles, fools and compotes. In fact one of my end-of-year rituals is making a batch of Cape Gooseberry jam as the ultimate topping for morning toast. Today, though, we’re letting them loose on the tarte Tatin, named after the Tatin sisters, who ran a hotel-restaurant in Lamotte-Beuvron, France, at the beginning of the 20th century. The original was a tart of caramelized apples cooked under a pastry lid, then flipped over so that the pastry is on the bottom and fruit on top, then served with lashings of crème fraîche. For some reason, in our house, my husband holds the tarte Tatin portfolio—I’ve never actually made one. I always assumed they were a major French faff (perhaps that’s what my husband would like me to think! ); in fact nothing could be easier—the only thing that requires some effort is the pastry but you can even use a ready-made puff pastry for the least strenuous dessert imaginable. You will need a 20-23cm tin or dish that is happy both on the stove and in the oven. To make the pastry, sift the flour and salt into a large bowl. Add the butter and rub into the flour with fingertips until the mixture resembles breadcrumbs. Stir in the sugar, then add the egg yolks and orange flower water. Stir to bring the mixture together. If it is still dry and crumbly, add a little water, but don’t let the pastry get sticky. Knead the pastry gently to form a ball, cover with cling film and chill in the fridge for 30 minutes. In the oven-proof and flameproof shallow tin, melt the butter and sugar. Split the vanilla pod in half lengthways and scrape the seeds into the tin. Tip the cape gooseberries in and coat with the caramel. Make sure you use enough fruit so it’s tightly packed on the bottom of the tin—this will improve the appearance of the finished tart. Let the fruit cook for a few minutes to release some of its juice into the caramel. Then let the caramel bubble long enough to thicken, a couple of minutes—stop before the fruit darkens or gets soggy. Take off the heat and leave to cool. Preheat the oven to 190 degrees Celsius. Lightly flour a work surface and roll out the pastry to a little larger than the tin. Carefully lift the pastry and place on top of the fruit. Press the edges down to encase the fruit. Bake the tart for about 30 minutes until the pastry is nice and brown. Let the tart cool for a minute or two, then take a plate that is larger than the tin and place it face down over the tart. Carefully flip the tart on to the plate and remove the tin. 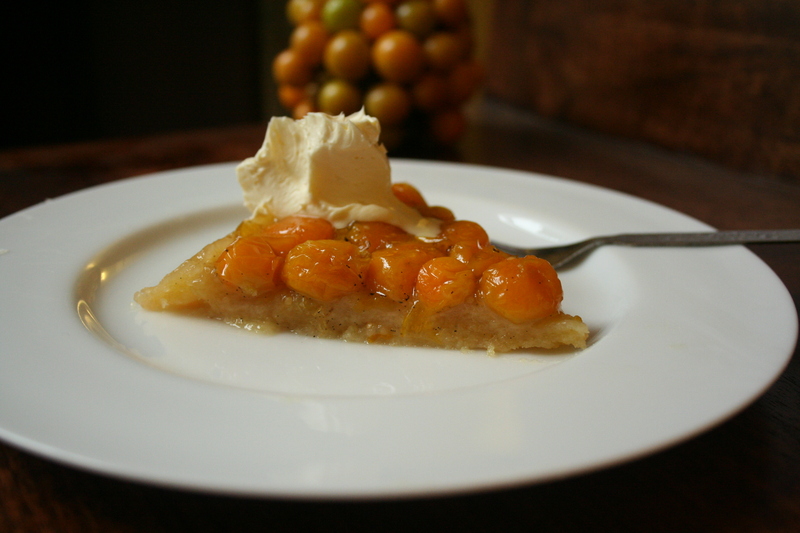 The cape gooseberries should now have formed a wonderfully sunny, caramelized topping. If any of the cape gooseberries has rolled out of position, just push it back so that the fruit is evenly distributed over the pastry. Fab recipe Pamela. I’ve made cape goseberry chutney in the past. Looks delicious in a tart. Though I’d defo use ready pastry;) Bookmarked! A pancake with it is a favorite with us. I have tried to make the ‘caramel’ at the start of this recipe twice now with zero luck-the butter separates, the milk solid and the up sugar combined to form a toffee that sticks together & hardens the minute it cools & the fruit just stays coated in the clarfied butter. Are your measurements wrong or is there some trick to this? ?